Description: A trio of units get a roll-by from a parent and child on a pedestrian bridge. Description: BH 1 rolls north to the connection to their own line, passing through the C&H Bevier St yard with quite a set of power. Description: BH 1 rolls out of the NYSW yard and past the Agway mill as it heads into Bevier St and ultimately to the Syracuse Branch. Today a pair of western visitors are in the lead, a really unusual treat. Description: BH 1 rolls out of the trees on the south end of the Chenango River bridge and over the water. Description: BH 1 takes the switch for the Syracuse Branch at Forks. Its 77 cars will cause some consternation for the motorists on NY 12 as it slowly clears the interlocking. I'm standing about where the south end of the old DLW station stood until 1976. 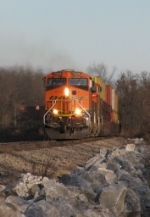 Description: Accelerating her wstbound manifest on the CSX mainline at sunset. Description: I thnk thats one of those Rocket Booster cars head-out. 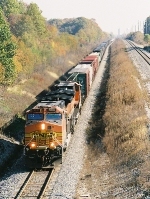 Description: Memphis to LA stacker BNSF Train Q MEMLAC1 06 approaches US 71 just west of Neosho. 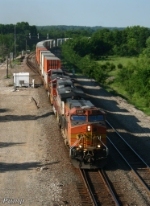 Description: Too bad the Warbonnets weren't leading BNSF Train Q CHISBD6 26 past West Holliday. Description: BNSF 5267 heads a manifest east under the ATSF signal at Toluca. 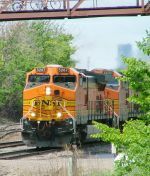 Description: While waiting on the UP 1983 we observed this westbound BNSF stacker on the Transcon. Description: heading to the service area. Description: So after my knee surgery even crutches weren't going to stop me railfanning, I just slid down hill haha.